Water, milk, sucrose, non-dairy creamer, strawberry juice, stabilisers (E473, E339), colouring (E120, strawberry flavour. Best served when chilled. Shake well before opening. 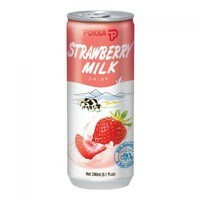 Consume promptly after opening.The appearance of milk particles in this product is natural and does not affect the quality.